We hope everyone is fantastic! Our judges are hard at work going through all of your submissions! As a reminder, winners will be announced on July 1st, so stay tuned. In the meantime, we have another event coming up called Girl Power Biz Camp from July 18-22 in NY. It's FREE and open to high school girls! GPBC is a digital media/business boot camp that will teach you everything from media development to consumer insights. Food will be provided, and there will be (once again) amazing tech and swag up for grabs! If you're interested, check out our website for more information. #WeHackToo has come to a close and we thank you for joining us. We hope it was a rewarding experience for everyone. Judges will now review, deliberate and submit their final scores by Thursday. Winners will be announced on Friday, July 1st. 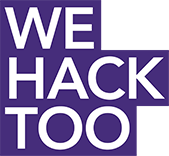 Please visit us here on Devpost, www.wehacktoo.org or @bstemproject (twitter, facebook and instagram) for the results. We hope that you will join us again and continue to blaze trails! Hello WE HACK TOO ladies! The time is drawing near and we'e so excited to see all of your projects! 1. Problem—What problem are you hoping to solve? Who is affected by this problem? Hello WE HACK TOO hackers! We are so excited to see all your prototypes and presentations highlighting your business strategy. Be sure not to miss the deadline tonight 11:59 PST. We would love to hear how things are going. When you take a break, we encourage you to post a video message introducing yourselves and tag us on twitter, facebook and instagram @bstemproject. Thank you for joining We Hack Too and here's to a great finish! Follow B~STEM Project on social media!